I recently received some alphabet diecuts from Lifestyle Crafts to try out on my Epic. 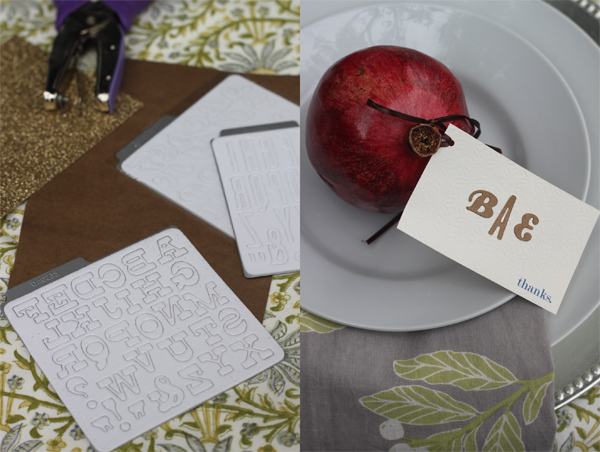 I've used them to design three unique ways to dress up your Thanksgiving table. If you enjoy them, which I hope you will, the stationary templates are available for download below. Note: I intended to use gold glitter sticker paper for these projects, which turned out to be a total fail. The paper was much too thick and tacky for the dies to handle, so keep that in mind and use traditional stationary or scrapbook paper for the best cuts. The paper below is a metallic bronze and all monograms were applied with glue dots. 1. Seating Assignments. 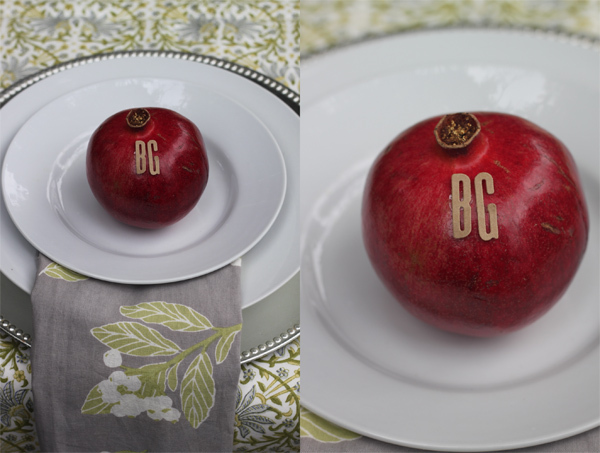 Add monograms to seasonal fruit for a pop of color that marks each place setting. I used pomegranates but pears, mini pumpkins or persimmons would be lovely options as well. 2. Give thanks. The outside of these cards contain a monogram for each guest. The inside holds the message 'thanks for...'. 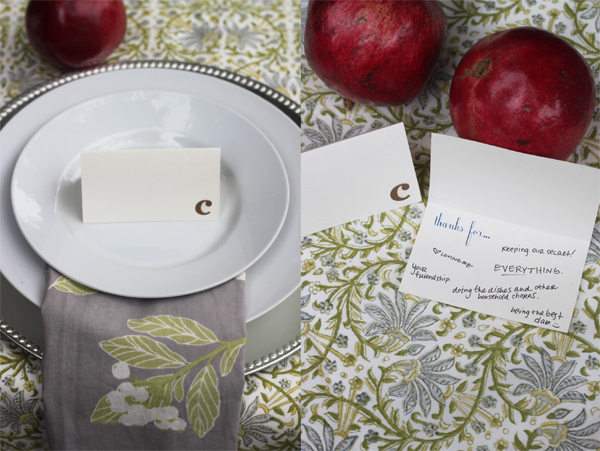 Make sure everyone is given a pen at their place setting and after dinner, pass cards around the table clockwise so that everyone may write a simple note of thanks to each guest at the table. 3. Send home a favor. 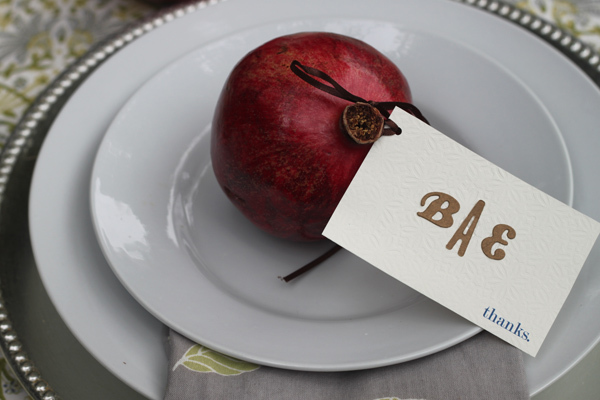 Pomegranates are again used here, but depending on the size of your gathering, favors can vary from a boxed-up slice of pumpkin pie to a bottle of wine. This tag was blind embossed using the Epic which gives it extra texture and elegance. The dielines will be available on the Lifestyle Crafts website after Nov 15th. If you're interested in trying these or other products for yourself, enter the promo code 'CAKE' at checkout for a 20% discount. (PS: these dies work with all manual die-cutting machines, not just the Epic). This is a sponsored post, but the above review is my honest opinion. If you have a shop that you think would be a good fit for Cake. we'd love to hear from you. how creative! love those pom fruits. I love this idea! I bought place cards recently that will work perfectly. Thank YOU!